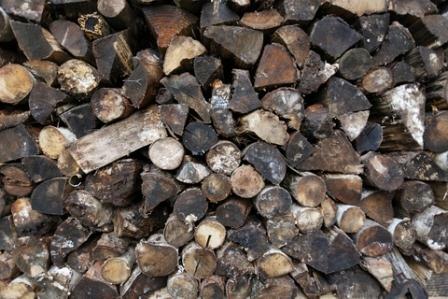 Drying firewood before burning is important if you are to use wood heat successfully. Ideally you will bring the moisture content of your logs down from between 50 to 80% moisture by weight, to about 18% or less. The more water you get out the more easily your fuel wood will burn, and the more heat you will get from the log. Moisture in firewood comes in two forms - "free" water is that loose in the log, usually in the sap. This water is free to move within the fibres of the log and is easier to dry off than "bound" water. Bound water is found within the cells of the timber and is harder to remove. Typically you can dry firewood down to about 30% moisture content within a few months, but getting it the rest of the way takes up to 2 years. Use a moisture meter to test the water content of your wood - remember, 20% or lower is "seasoned"
If, as I do, you live in a country with wet winters, rather than cold snowy winters, you can still dry your firewood throughout the winter months. Rain adds surface moisture, but this free water is easily evaporated off once the wind and sun get to the log. If you can keep that rain off in the first place, however, your logs will dry even faster! When we were doing some clearing of some trees and scrub around the garden recently, we ended up with about 1/3rd of a cord of stacked firewood. Part of the spot we cleared were the lower branches from a hedge of giant lelandii - this made a lovely sheltered space under the tree branches. It faces south so gets the best of the sun, a decent through breeze but all but the very worst rain gets caught up in the branches overhead. I expect this particular load of firewood to dry quickly over the summer, and hopefully stay relatively dry through the winter too. If you need wood to burn immediately, then you should look at purchasing a good load of kiln dried firewood - it comes at a premium price but you are guaranteed the quality, and wood that will burn hot and clean! What ever method you use, don't forget that the main thing you need is plenty of TIME - 6 months over a good hot summer will go a fair way, but for the very best seasoned firewood you need more like two full years. Even if you buy in wood from a supplier you can't be sure that it will be as dry as you might prefer. 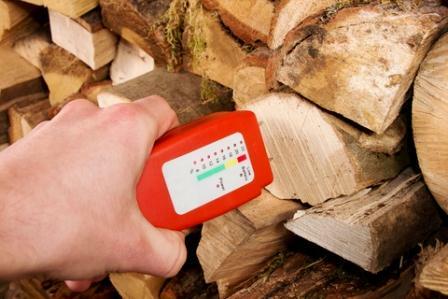 If in doubt you could try using a moisture probe, which works out the approximate moisture content of a log, or just assume that you will need to dry all logs for a further full year. If you want get a better idea of the moisture content of your logs you could also perform a weight test. This will give you a figure for the moisture percentage of your seasoned firewood. It is more accurate than a moisture probe, but harder to do. Do you have a great tip for getting your firewood dry? Do you have a great story about drying your firewood? Share it!